The debut from Lancaster, PA’s Slimtfit, Make It Worse, is not without its bright spots, even if it sounds like something we’ve heard before. 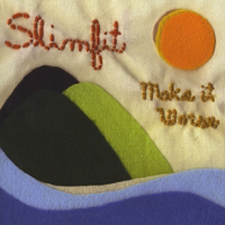 If this album were on shuffle, the first song on could make one think Slimfit was rooted in late-90s punk, or it could be a straight-ahead country rollick. “Dancin’ Shoes” is a duet with every country cliché possible—a male-female point-counterpoint, some fiddle, shuffle rhythm-section work, and electric guitar fills straight from a 1970s Pure Prairie League number. And it works as one of the better songs on the album. The wide-ranging instrumentation on the album is notable. Between the five of them, the members of Slimfit can handle any tool of their trade. “Pony Up” might fall somewhere between Uncle Tupelo and Everclear. It moves like an alt-country song, but it is sung in a way that comes down in that late-90s alternative rock territory: “Whatever happened to all those things you said you already know/Cause I can’t tell you anything that you already know.” The band might be steeped a little too much in a modern-day good ‘ol boy, swigging-cheap-beer-beside-the-pick-up-truck image, but it at least seems genuine. While they do cull their sound from a number of sources, for now Slimfit is still co-opting their influences a little too much. As a debut, Make It Worse is a solid effort by solid musicians. Their next task is to make this music their own.